Low-carbohydrate diets can be very beneficial for people with type 1 diabetes. Reducing carbohydrate intake can help to largely eliminate the spikes and crashes in sugar levels that are common on higher carb diets. Whilst low-carb diets may not be for everyone, those that maintain the diet tend to achieve very good blood glucose control and enjoy a renewed sense of confidence and well-being. A pioneer in the popularity of low-carbohydrate diets for type 1 diabetes is engineer-turned-physician Dr. Richard K. Bernstein. Low-carb diets can also help children that are overweight to lose weight and reduce the risk of developing chronic health problems including type 2 diabetes and heart problems. Bernstein’s approach is based around his ‘law of small numbers’ which states that that smaller doses of insulin will result in smaller errors of judgment and therefore improved blood glucose control. To illustrate his approach, if you inject 10 units of insulin to cover your lunch but make up to a 25% error, you could end up injecting up to 2.5 units too many or too few which could lead to much too high or low blood sugar levels. By contrast an injection of 4 units of insulin with the same error would result in on over- or under-dose of up to 1 unit. In this case, any error won’t be as problematic or dangerous as it would be for the 10-unit dose. How low carb to go? We all have different needs and lifestyles so it’s best to find a level of carbohydrate that works well for you. For example, one person may wish to continue eating some starchy foods, such as bread and rice, but in smaller quantities and may therefore aim for a carbohydrate intake of 100-150g per day. Another person may wish to cut out starchy foods altogether, particularly if they’re wanting to lose weight too, and may aim for a carbohydrate intake of under 50g per day. If you are starting a low-carb diet, it may be safest to lower your carbohydrate intake gradually to minimise the risk of hypos. A strong benefit of a low-carb diet is that you have a much lower risk of severe hypos occurring. There is a flip side to, however, as hypos may come on more gradually and this could lead to some people spending more time than usual in hypo territory overall. Be aware that if you spend long periods of time with low blood sugar, you may lose hypo awareness. Loss of hypo awareness is when you become unable to spot when you are hypo. Hypo unawareness can be prevented by avoiding any lengthy periods of low blood sugar. Testing regularly, including between meals, will help you to spot how your blood glucose levels are responding between meals and help you to spot any hypos that may be occurring. 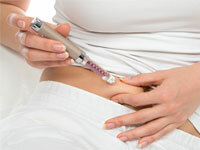 If you can afford it, you may consider buying a continuous glucose monitor (CGM). You may also request, from your health team, to go onto a CGM for a trial period. Be aware that protein can also raise blood sugar levels, albeit to much less of an extent than carbohydrate. If you have a sizable amount of protein, such as a steak, 3 or more eggs, or a number of sausages, you may need to take a small additional dose of insulin after meals to counteract the raise in blood sugar from protein. The rise in blood sugar from protein-based foods is slower than for carbohydrate and may typically peak anywhere between 2 and 5 hours after eating. One way to review the effect of protein is to take blood glucose readings every 30 or 60 minutes after eating for up to 5 hours. If you have access to a continuous glucose monitor, the effect of protein on blood sugar will be a lot easier to track. If you are on rapid-acting insulin, such as Humalog, NovoRapid or Apidra, you may need to take a small additional bolus dose 2 to 3 hours after eating a sizable amount of protein. It is best to use additional bolus doses with caution, taking very small doses, until you get used to the effects of different sizes of protein. A study published in 2012 by Swedish researchers monitored the progress of 48 people with type 1 diabetes that had their carbohydrate intake limited to 75g or less of carbohydrate per day. The results showed that when participants were motivated to follow the diet well, and half of the participants were, the diet showed excellent results. Those that adhered to the diet reduced their HbA1c from 61 mmol/mol (7.7%) at the start of the diet to 46 mmol/mol (6.4%) after four years of following the diet.